The Fraunhofer FEP's aim is to seize the innovation potential of organic electronics, the electron beam and plasma technology for new production processes and devices and to make it available for its customers. COMEDD (the Center for Organics, Materials and Electronic Devices Dresden), established in 2009 as a department of the Fraunhofer IPMS, was turned into an independent Fraunhofer Institute in 2012 and now it is a business unit at Fraunhofer FEP. In 2013 COMEDD started to produce OLED lighting samples (including transparent ones) and offer these under the TABOLA brand. In July 2013 we published a spotlight article on COMEDD detailing their recent technologies and products. The TABOLA panels are no longer in production. 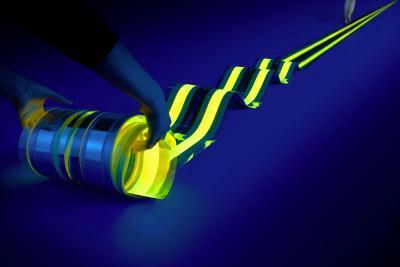 Researchers from the Fraunhofer FEP Institute developed a miniaturized OLED-on-silicon based phosphorescence sensor. Such sensors are used today typically for oxygen concentration measurement. The researchers say that this technology enables a small-sized sensor that offers a fast and precise evaluation. In the future such sensors could be produced at a relatively low cost. 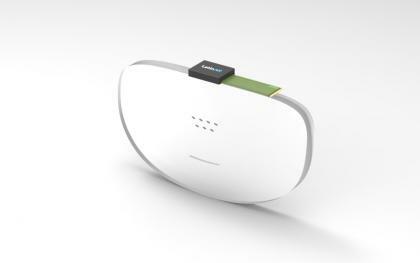 The new sensor is based on a chemical marker that is excited by modulated blue OLED light. The phosphorescent response of the marker is then detected directly inside the sensor chip. The OLED device is 4.7 x 2.2 mm in size. 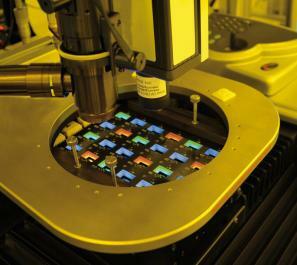 The researchers hope to be able to reduce the size of the entire chip down to 2 x 2 mm. 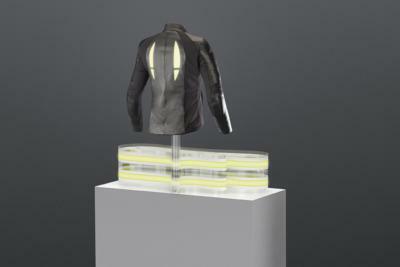 Researchers at the Fraunhofer FEP institute developed a new wearable OLED-based "button" that can be integrated into textiles. The OLEDs can be designed in any shape, be transparent, dimmable and also patterned. There is also a two-color variant. The Fraunhofer developers say that such elements can be used for fashion trends, branding, safety applications, light therapy and more. The so-called O-Button is based on an OLED deposited on a wafer-thin foil combined with a micro-controller on a conventional circuit board. In January 2015 the EU launched the LOMID project to develop next-generation large-area OLED microdisplays, and in 2017 the partners in the project announced the production of a 1-inch diagonal 1200x1920 (2,300 PPI) 120Hz curved OLED microdisplay. The Fraunhofer FEP demonstrated this panel at SID 2018, as you can see in the video above. The institute also demonstrated a new design which uses two such panels and special optics to provide double the resolution for each eye. The Fraunhofer FEP, together with VTT and the Holst Center developed a new wearable OLED lighting bracelet, one of the first one of the first flexible organic electronic product to be produced at the European PI-SCALE pilot production line. The yellow and red OLED deposition in this prototype was performed at the Fraunhofer FPP (which can handle both sheet-to-sheet and roll-to-roll processes), while the barrier web was produced at the Holst Centre. VTT integrated the OLEDs into the bracelet. Such a bracelet, with its low power consumption, could be used as a security device, as a fashion jewelry, and more. In January 2015 the EU launched a new project to develop next-generation large-area OLED microdisplays. The so-called LOMID (Large cost-effective OLED microdisplays and their applications) project's main goal is to produce 13x21 mm (~1-inch diagonal) 1200x1920 (2,300 PPI) 120Hz curved OLED microdisplay. Dr. Uwe Fogel, the project's coordinator from the Fraunhofer FEP institute, updated today that the consortium managed to produce the first microdisplay samples at satisfactory yields, and it is now improving these yields. LOMID partners are already demonstrating the microdisplays in smart glasses for both VR and visually-impaired people.